I’ve said this quite a few times here, but my husband loves soup. He loves pretty much everything about it, especially if it’s thick, hearty and beefy broth. He loves the way the carrots get smooshy, but not too smooshy that they’re falling apart. I’m also pretty sure in soup is the only way he’ll eat celery too. 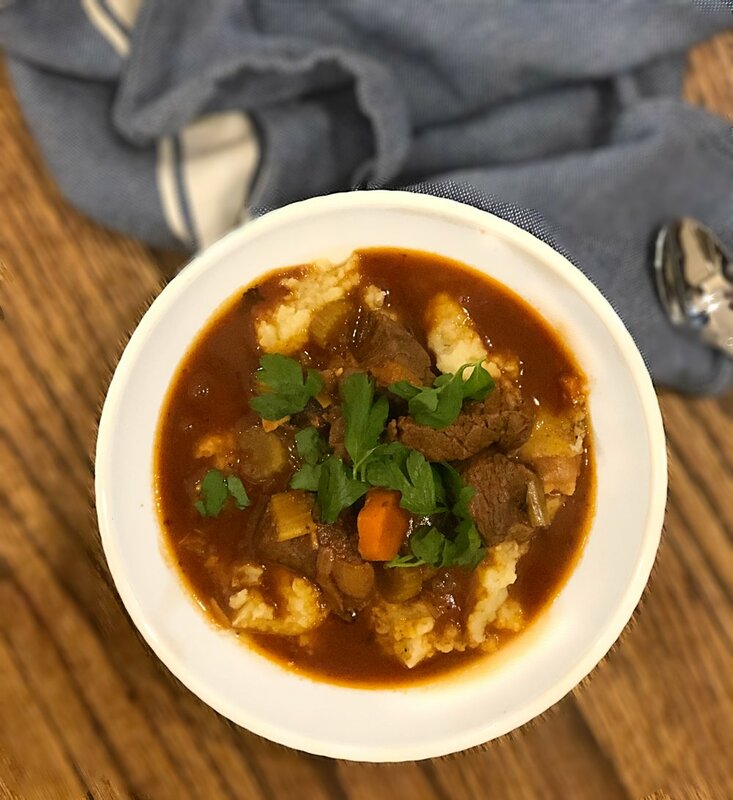 Anyway, he was away for the weekend a few weeks ago, so I decided to make this stew as a “welcome home to the first chilly Fall day,” and it was a HUGE hit. It was also a hit on Instagram. I got dozens of messages asking for this recipe, so here we go! Ask and you shall receive. I hope you make this stew, and that it fills your belly in the heartiest way, that makes you have a great great chilly Fall sleep! First, make the mashed potatoes in your instant pot. Wash and quarter your potatoes. Put your potatoes in the Instant Pot with the ghee, Kite Hill, Paleo Ranch, and Salt and Pepper, with about 1/2 of beef broth. Hit manual for "High Pressure” for 10 minutes. When the potatoes are done, mash up with a fork or potato masher, and remove from Instant Pot. Next, turn your Instant Pot to saute. In the pot of your instant pot, heat half of the oil and the ghee. Pat the meat dry with paper towels. Season the meat well with salt and pepper. Add the meat to the pot, and brown all sides. After its brown, remove the meat to a separate plate. If there’s anything stuck to the pot…GOOD. We like these, splash in some of the broth, and scrape those little bits up! Keep the fat in the pot, and add the onion and garlic and cook, scraping up the other brown bits, for about 6 minutes. Add the tomato paste, and mix in to onions and garlic, until the tomato paste turns a little bit of a darker color, about 2 minutes. Add the beef broth, scraping up any new brown bits, and return the beef with any juices to the pot. Add the carrots, celery, jalapeno, and bay leaves. Add the top to the Instant Pot, move the handle to sealing, and hit the setting for “stew/chili.” Let it rip! When you’re ready to serve, add a hearty stew of mashed potatoes to each bowl, and top with a ladle of stew. Top with green onion, cilantro, or cheese if you’re in to that kind of thing.